You can rent up to 10 farms in TOTAL (eg. you can’t have 10 small fences and 10 strong fences) and mix and match the different farms (eg. 4 small fences and 6 strong fences). But you can’t rent another of the same item whilst it is in your inventory. You must place the farm first or put it in your warehouse to be able to rent another. You can also get the Shabby Fence as a quest reward (0 CP cost) which has 1 slot. This is useful if you have less than 10 farms. The Old Moon Fence requires Master Lv. 1 in Farming and is the same CP and slots as the strong fence, but is much smaller in size, which makes it more efficient to tend to and uses less fertilizer. If you aren’t using workers to tend to your farms, using smaller fences is far more efficient for your CP. 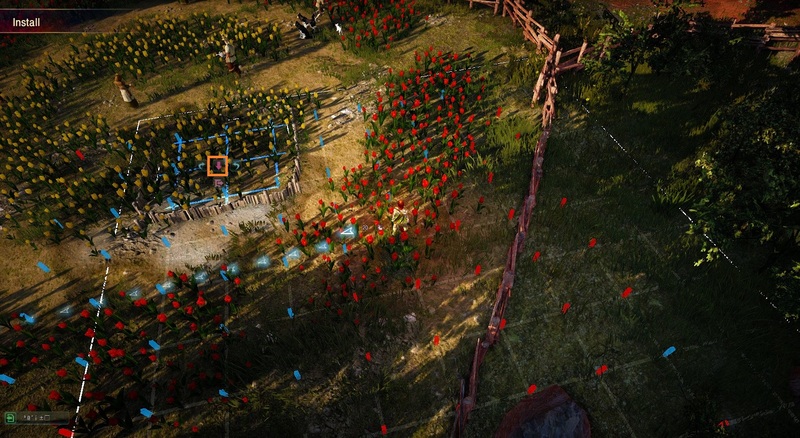 If you have 30 contribution points, you will get a total of 40 slots by using 10 small fences, compared to 30 slots using 3 strong fences. You should aim to use as many small fences as you can and I only recommend using strong fences if you want to use a total of 100 contribution points for the maximum of 100 slots or if you are planning to use haystacks. To place your farm you simply need to right-click the item in your inventory. Farms can’t be placed in safe zones and must be in a grassy area. When placing the farm make sure that all of the area is blue and none of the edges are in a red zone, then click the confirm button to start building your farm. (Click the image below to view full size) Farms can overlap with another player’s farm, however, when you stand on your farm all other player’s farms will disappear so you can easily harvest your crops. Once your farm is placed it can be found using this icon on your map. Farms expire every 7 days. I would personally recommend placing your farm in Velia if possible due to it’s convenience and high groundwater value as well as great crate bonus rates and workshops. But Heidel and Calpheon are also good locations for most crops. If you’re looking for the lowest possible growing time you will want to place the farm in the best spot for a particular crop. Different crops need different temperatures and humidity. You can check a specific crops information by planting the seed then pressing R next to it to view it’s information. We’ll go into more detail on each of these later on but it’s important to note that you can check groundwater, temperate and humidity on your map in-game. You will want to place your farms as close to each other as possible because when it comes to tending to your farm, you can use less fertilizer/water if your farms are placed correctly. Make sure there is no gap between the farms! You’ll find more information on this below in the Tending to your farm section. Gathering – seeds can be gathered from bushes or thickets using your bare hands or a hoe. It is completely random which seeds you will get so the method can be very slow and take up a lot of energy, but it is the only way of getting free seeds. Seed Vendors – there are seed vendors at Loggia Farm, Olvia, Glish, Heidel, Calpheon, Kasula Farm, Altinova, Sand Grain Bazaar and Valencia. They do have a poor selection of seeds and don’t offer higher quality seeds, but these are good starting points if you are looking to begin farming. You can use the NPC button in the top right (next to your mini-map) then search for “seed” to quickly find all the seed merchants you have discovered. Market Place – the market place is where you want to go for your seeds if you’re looking to get top quality crops straight away. Sometimes you can’t find the seeds you want but you can often find cheaper seeds here than from the vendors. I highly recommend buying your seeds from the market place where you can because with most crops it will increase your profits if you choose to sell the crops. If you’re looking for maximum yield, buying the seeds instead of breeding the seeds will also increase the amount of crops you are left with. To begin planting go up to your farm and press R to open installation mode. Click the seeds at the bottom and move them into place on your farm and click the confirm button. 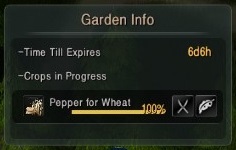 In the top left you can see “Garden Usage”, this indicates how many seeds we can fit on the farm. The window in the middle of the screen indicates the temperature, humidity, amount of water, and fertilizer the farm currently has. It also shows how long the seeds will take to grow. You can view the temperature, humidity and groundwater using the filters on your world map. It’s important to note that crops only grow whilst you are online! Once you’ve placed a crop on your farm, you can view it’s information by pressing R next to it. You will see all the garden and crop information here. Temperature is how warm or cold the area is. Some crops, such as Sunflowers, will grow better in warmer temperatures. The bright red bar indicates the temperature range of your garden. The pointer shows the crops preferred temperature. 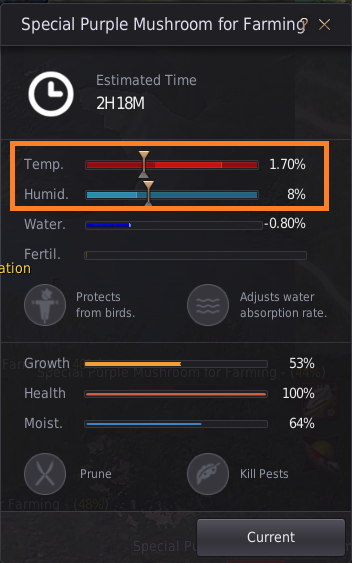 The percentage on the right tells you the growth rate of the crop every 5 minutes. The highest percentage you can get is 1.80%. Humidity changes as it rains. The blue bar indicates the humidity of your garden whilst the pointer shows the crops preferred humidity. The percentage on the right tells you the chance of the crop getting blighted by insects or pests every 5 minutes. The highest percentage you can get is 10% and lowest is 3%. Groundwater is the amount of water around your farm. When it rains this will increase. In places which are hotter, there may not be as much groundwater. You can use waterways to make groundwater last longer and give your crops the right amount of water that they need and you can manually pour water on the garden as well. The percentage on the right tells you the amount that the moisture will increase/drop every 5 minutes. You want the highest possible percentage as a negative percentage is how much it will drop. You will want to use water or waterways to increase the amount of groundwater. Groundwater is very important because if the moisture level reaches 0 then your plants will rot and you will only get 50% of your yield. Once a seed has been placed it will begin to grow. Exit the installation screen by pressing Esc and clicking yes. If you do not have a scarecrow or waterway on your farm you will need to tend to the crops more often by cutting and getting rid of insects. If your farm needs tending to, the icon on your map will turn red. Simply go to your crops and press R to tend to the crops. You can view your crops progress by hovering your mouse over the icon on your map, once the crops reach 100% they are ready to be harvested. To harvest, go to your crops and press R. You also have the choice of “Breeding”. If you choose to breed the crops you will have a chance to get more seeds back, as well as increasing the quality of the seeds. Once the crop is at 100% growth, you will get an average of 70 crops for white grade seeds, 50 for high quality and 30 for special quality seeds (if the seed takes 2 slots this is doubled). You also have a chance of extra yields which gives you an additional 1 – 5 crops. If your plant is at 200% growth it will be an old crop and only yield 50% of this. Scarecrows and Waterways are used to decrease the amount of time you need to spend tending to your farm and increase the quality of your crops. Scarecrows reduce the chance of bird attacks, while waterways decrease the amount of water consumption. If your farm runs out of water your crops will either be lower quality or you will get far less crops than usual from the harvest. Waterways will make the natural groundwater last longer, but if you water your plants when you first plant them you shouldn’t need to come back to tend them for a much longer time. To craft these items for your farm you will need a woodworking workshop. Once these items are placed on your farm they will take up a slot each so you will not be able to plant as many seeds but you won’t have to tend to them as often. Personally, I don’t use scarecrows or waterways as I feel they take up too much space and are only efficient on Strong Fences. The damage from bird attacks is very minor and waterways are only really required in dry areas such as the desert. Before I go into tending to your farm more, I would like to highlight the 2 main reasons for farming and how they play a role in tending to your farms. If you are looking to collect materials for profit or production. I highly recommend using fertilizer, water and workers to tend to your farm. This will ensure that the growth time is as low as possible but you will not get any shards or farming XP. If you’re looking for the loot from pruning/removing insects, such as weeds, spirit’s leaf, shards, monk’s branch, etc. Then you will want to use no workers and tend to the farm as often as possible. You won’t want to use fertilizer or water (which will decrease your yields) but you will be able to tend to them more and level your farming quicker. Inorganic Fertilizer will boost your crops by approximately 50%. To craft Inorganic Fertilizer you will need either Wheat x5, Barley x5, Corn x5, Potato x5 OR Sweet Potato x5 (high quality x3 products can be used or special x1 product – For example, Wheat x5, High Quality Wheat x3 or Special Wheat x1). Pick which type of grain you’d like to use then press “L” to open the crafting window. Select the “Drying” option to turn the grain into Inorganic Fertilizer. Byproduct Fertilizer will boost your crops by approximately 65%. To craft Fertilzer Byproduct you will need Inorganic Fertilizer x3 and Leavening Agent x2. Leavening Agent can be bought from a cooking merchant or innkeeper. Once you have the ingredients, press “L” to open the crafting window and select the “Shaking and Maxing” option. Organic Fertilizer will boost your crops by approximately 85%. To craft Organic Fertilizer you will need Byproduct Fertilizer x1 and Distilled Water x2 (you can also use River/Sea/Turbid/Clean Water x3 or Purified Water x2). To obtain Distilled Water, buy an “empty bottle” from a materials merchant, collect river water, then heat the river water. Once you have the ingredients, press “L” to open the crafting window and select the “Shaking and Mixing” option to craft Organic Fertilizer. Purified Water is obtained by filtering a bottle of water or bag of muddy water. It is also sold by some general goods NPCs in Valencia. Purified water increases crop growth rate by Rain 15. Distilled Water is obtained by heating a bottle of river water. Distilled water increases crop growth rate by Precipitation 15. Mineral Water can be bought from cooking merchants. Mineral water increases crop growth rate by Precipitation 5. Bag of Muddy Water is obtained by shoveling in the desert or collecting water in the desert using workers. Bag of Muddy Water increases crop growth rate by Precipitation 5. 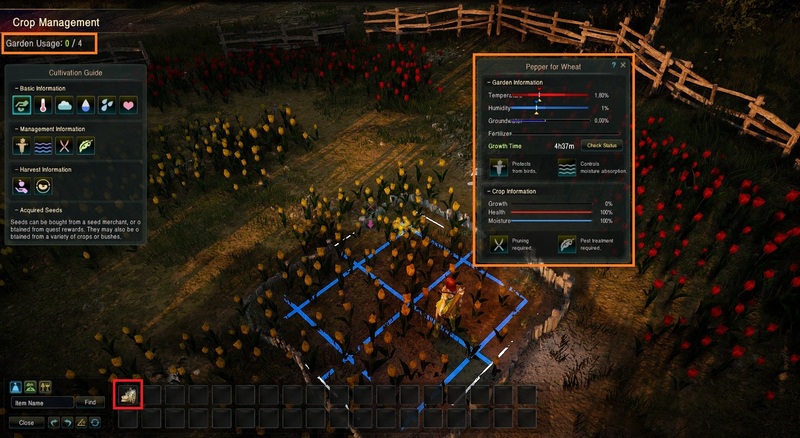 Make sure you are stood on the farm then right-click the water in your inventory to water the crops. You do not need to use fertilizer/water on each farm and can actually use far less by placing your farms efficiently. The orange squares show how you should place your farms (leave no spaces), whilst the black dot shows where you should stand when using the fertilizer or water, and the black circle shows the range the fertilizer will reach. Also, you should make sure you water the plants AFTER using fertilizer because using fertilizer will drain the water. You can use your workers to tend to your farms while you are busy. They will prune weeds and remove bugs until they run out of action points but you can only have one worker on each farm at a time. Workers will not harvest/breed seeds for you and you will not get any farming XP or Sharp/Hard shards. Farm workers also use a lot of beer very quickly! To set up your workers so that they tend to your farm, left click on the farm icon in the top right, then click the “list” button next to your farm. You can then select which worker you would like to send to your farm. As you can see in the screenshot above, workers do not have to have to be connected to the nearby nodes. You can use any worker which is available but the worker will have to travel from the where they are. The workers will store items all items they obtained by tending, at the warehouse. Giant workers are the best workers to use for tending to your farm, this is because Giant workers have more action points and will not need to be fed as often. They will usually be able to make it all the way through the growth of the plant without needing to be fed. Personally, I recommend pruning the farms yourself unless you have a lot of farms to tend to or not enough time to keep pruning them manually. Another option is to use workers until the crops are ~60% only. Doing this will let the crops grow quickly but the crops will usually need to be pruned when you harvest/breed them and you can get some sharp/hard shards this way as well. Haystacks can be placed on your farm to feed cows. They take up 4 grid spaces in the garden but once a cow is fully grown, they can be harvested for milk, beef and ox hide. Haystacks are obtainable by going to the Processing window (L) then selecting “Drying” to dry 50 Weeds. They are also available as quest rewards in the farming quest line. Just like all other seeds, there are 2 additional grades of Haystacks: High-Quality and Special. These are obtainable when harvesting a Haystack. Normal Haystacks give 12 – 20 milk, High Quality give 25 – 40 milk and Special Haystacks can give an average of 50-60 milk each time. There is also a chance of gaining beef or ox hide and a special haystack gives an average of 15-20 beef or ox hide. Chicken Feed can be placed on your farm to feed chickens. They take up 3 grid spaces in the garden but once a chicken is fully grown, they can be harvested for chicken meat and eggs. Chicken Feed is obtainable by going to the Processing window (L) then selecting “Grinding” to grind 20 Rough Stone and 100 Barley. Just like all other seeds, there are 2 additional grades of Chicken Feed: Good and Special. These are obtainable when harvesting Chicken Feed. Normal Chicken Feed give 15 – 30 eggs with 0 – 10 chicken meat and on average take around 8 hours to grow. Mysterious Seeds can be obtained by harvesting, breeding, pruning or killing pests on a Special/Magical seed. Mysterious seeds can then be processed with Processing (L) > Shaking, with a special seed/hypha to create Magical seeds. For example, you can use a Mysterious Seed and shake it with a Special Strawberry Seed, to create a Mysterious Strawberry Seed. This seed can then be placed on your farm but you must be Artisan 1 in farming to tend to the Magical seed, or harvest/breed it. Magical Seeds will take up 5 slots on a farm and highly increase the yield when harvesting, and also increase the amount of fruit when breeding. The downside to using Mysterious Seeds is that you will need a larger farm and they do not give any extra chances of sharp/hard shards or additional farming EXP, meaning that if you want these it’s better for you to plant the regular seeds. If you are wanting higher yield or fruits however, then the Mysterious Seeds will be useful for you. You cannot sell Mysterious Seeds on the marketplace, and when processing them, they are unable to proc. Once you reach Artisan 1 in Farming, Magical seeds should be used to make profit and you should be breeding them to get high amounts of fruit. The byproducts you receive can also be exchanged for T9 horse materials which will heavily increase your profits. I’ll update this. Thank you for spotting it out the names were still from the old English patch in KR. Under the Fertilizer, the “fermenter” is the leavening agent sold by the cooking merchant.